Tall ships and the Queen Mary, reflected in the Pacific Ocean, at Long Beach. Please click on http://newtowndailyphoto.blogspot.com/ to see lots more Reflections. nice! I didn't notice the Queen Mary right away, I was so taken by the tall ships! I thought I recognized the Queen Mary and the Lighthouse restaurant. That's a nice area to walk around and your reflections are great! The water is like a mirror. I like your fractured reflections Jan! We had the tall ships sail up the Columbia--so much fun. Love the harbor. Beautiful reflections and boats. That's so pretty! I love harbor shots- always makes me think of Maine and my grandfather. 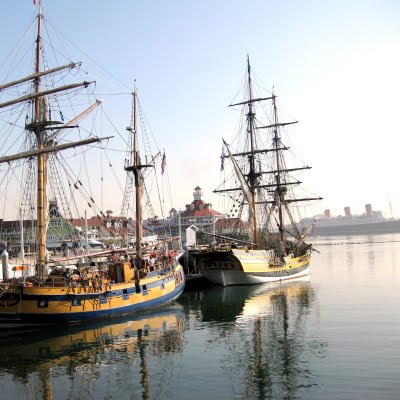 Don't you just love those old tall ships? They are so beautiful and are probably dwarfed by the Queen Mary, a beauty in it's own right. Nicely done. I love the tall ships. Love ships old and new, perfect shot nicely framed.